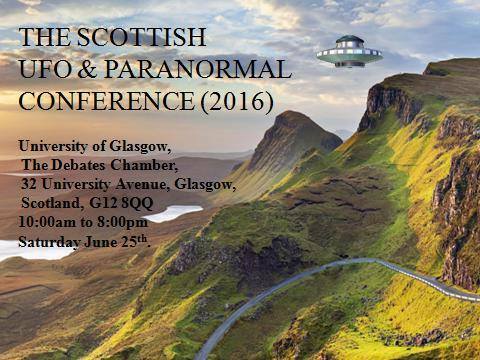 I'd like to inform you of the biggest paranormal event to occur in Scotland this year, The Scottish UFO & Paranormal Conference 2016. This will be occurring at the Debates Chamber, Glasgow University, 32 University Avenue, Glasgow, Scotland, G12 8Q on Saturday June 25th between 10:00am and 8:00pm. Charmaine Fraser, 'The UK Wildman, Is There A British Bigfoot'? The event will be hosted by well know Bonnybridge UFO Councillor, Billy Buchanan and is sponsored by Phenomena Magazine. If you only go to one conference this year, this is the one.